GoDaddy is one of the largest domain seller and web hosting service provider. 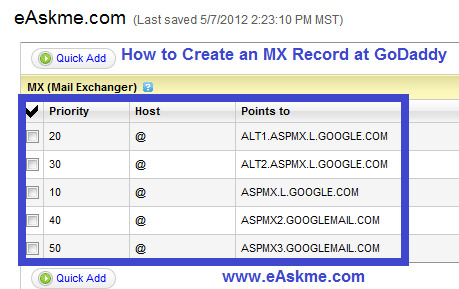 MX (mail exchange) record, that you can create in GoDaddy. MX record identifies server mail server. You can edit it in MX records in DNS page of Godaddy. How to Create an MX Record at GoDaddy ? Go to "Domains" and click on "My Domains". On "Detail" page click on "Total DNS Control and MX Records". In "MX" click on "ADD New MX Record". Enter details and click on "OK".